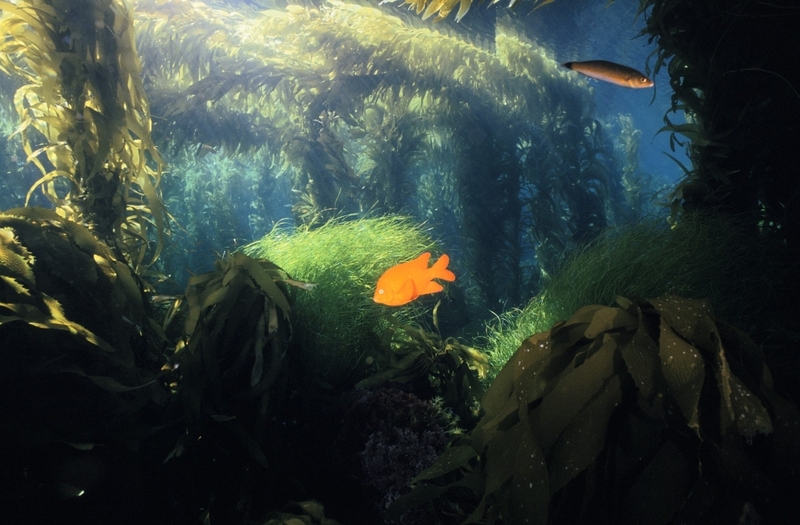 Giant kelp can grow up to 2-3 feet per day, and it creates dense underwater forests like the one pictured here. As efforts to move from fossil fuels to renewable energy sources intensify, scientists, government organizations, and corporations are eyeing a new source of renewable energy: macroalgae, more commonly known as “kelp.” Giant kelp, the largest species of algae, is incredibly productive – it can grow up to 2-3 feet in a single day – and recent breakthroughs in the conversion of kelp to biofuel now make kelp a potential alternative to land-based biofuels such as corn and sugar cane. Transitioning to kelp-based biofuels would have a number of environmental benefits, as kelp farms would not compete with food crops for land or require freshwater, pesticides or fertilizer. Furthermore, the United States has the world’s largest “marine exclusive economic zone,” i.e. area over which a nation has special rights regarding the development of marine resources, and the U.S. Department of Energy estimates that these marine resources could be leveraged to produce enough domestic kelp-based biofuel to support approximately 10% of the nation’s annual transportation energy demand. However, the United States has lagged behind many other countries when it comes to developing large-scale kelp farms. Significant increases in farm efficiency and productivity are needed to make a kelp biofuel industry economically feasible. This is the challenge that is being addressed by the Department of Energy’s Advanced Research Projects Agency-Energy (ARPA-E) through an ambitious new program called Macroalgae Research Inspiring Novel Energy Resources (MARINER). The goal of MARINER is “to develop the tools needed to allow the United States to become a world leader in marine biomass production for multiple important applications, including the production of biofuels.” The MARINER program recently announced that it would provide $22 million in funding to 18 projects that fall into one of 4 categories: (1) farm design, (2) computational modeling of farm hydrodynamics, (3) farm monitoring, and (4) development of advanced breeding and genetic tools. I am part of a team of scientists from UCLA and University of California – Santa Barbara (UCSB) who have been awarded $2.1 million from this program to develop and test technologies that can be used to monitor large-scale giant kelp farms. This project builds on our previous research using satellite imagery to monitor changes in natural kelp forests along the coast of California. Large-scale kelp farms would need to continuously monitor kelp productivity, biomass, and condition in order to maximize yields by harvesting at optimal times and avoid losses of kelp. We are developing tools to automate this monitoring in order to minimize farm labor costs. Our Scalable Aquaculture Monitoring System (SAMS) uses unmanned underwater vehicles (UUVs) and aerial drones to monitor kelp biomass, physiological condition and production, along with the environmental factors known to affect kelp growth. Eventually, this system will deliver near-real-time information to farm managers through all stages of the farming process, from planting to harvest. This summer, a team of students and faculty from UCLA and UCSB will start testing UUVs and drones in natural kelp forests off the coast of Santa Barbara. Within a few years, the team hopes to be working with new kelp farms off the coast of California to produce a more environmentally friendly biofuel. 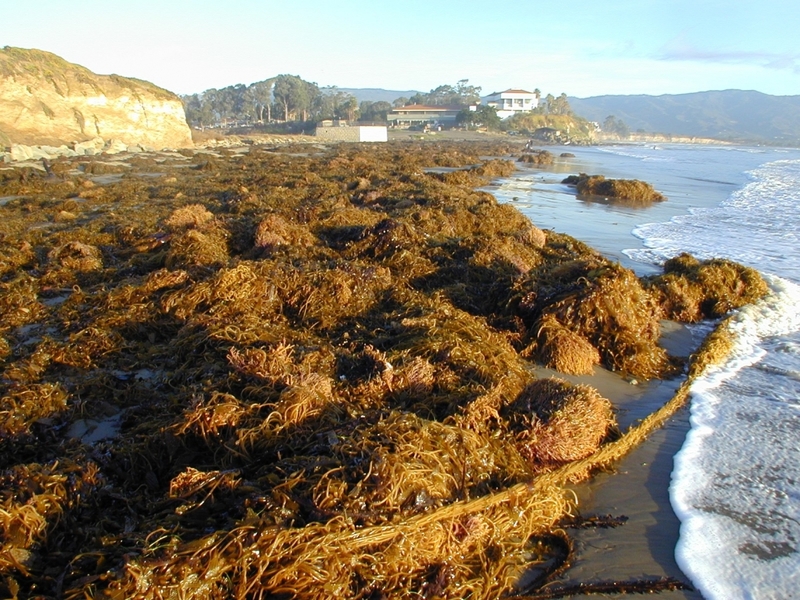 Giant kelp deposited on a beach near Santa Barbara after a large wave disturbance event. Dr. Kyle Cavanaugh is an Assistant Professor with research interests in coastal ecology, biogeography, spatial ecology, and remote sensing.